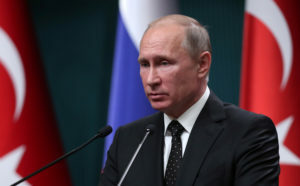 Putin says Russia will ‘never’ extradite citizens accused by U.S.
WASHINGTON — Russian President Vladimir Putin says his country will “never” extradite any of the 13 Russians indicted by the United States for election-meddling. Putin says Russia “does not extradite its citizens.” He’s referring to a provision in Russia’s constitution that prohibits extraditing Russian citizens to other states. Putin tells NBC News the 13 Russians “do not represent the Russian state” or Russian authorities. He says he has “no idea” what they did or who guided them. A detailed, 37-page indictment from special counsel Robert Mueller alleges Russian operatives used fake social media accounts and targeted messaging to interfere in the 2016 election.